January 26th is Australia Day. It marks the anniversary of settlement in 1788 – the arrival of the First Fleet from Britain into Port Jackson in New South Wales. Australia is a relatively young country. I remember visiting places like Salzburg in Europe and feeling such rich history and heritage there. We don’t have that here, but I still love my country dearly. On the whole, it is a beautiful country with good people. Where I’ve come from, we are quick to offer you a cuppa and always keen for a chat. We love home and we love our backyards and most of us have a barbecue out back. I love my backyard so much that I no longer have a dining room inside the house! We are the 6th largest country in the world, by geographical area. England fits into Australia about 58 times. It takes about 5 hours to fly across the country from Brisbane to Perth (south-west). However, more than 85% of us live within 50km of the coast – the inland areas are much less inhabited. PS Apparently Australians swallow about 3 spiders each year – eek!!! Enjoy the festivities and have a spider or two on me! Thanks Norm. Yes, it’s a bit of a hike! But I think it will be worth the trip. Yes thankyou – almost time for a BBQ and a chilled sauvignon blanc! 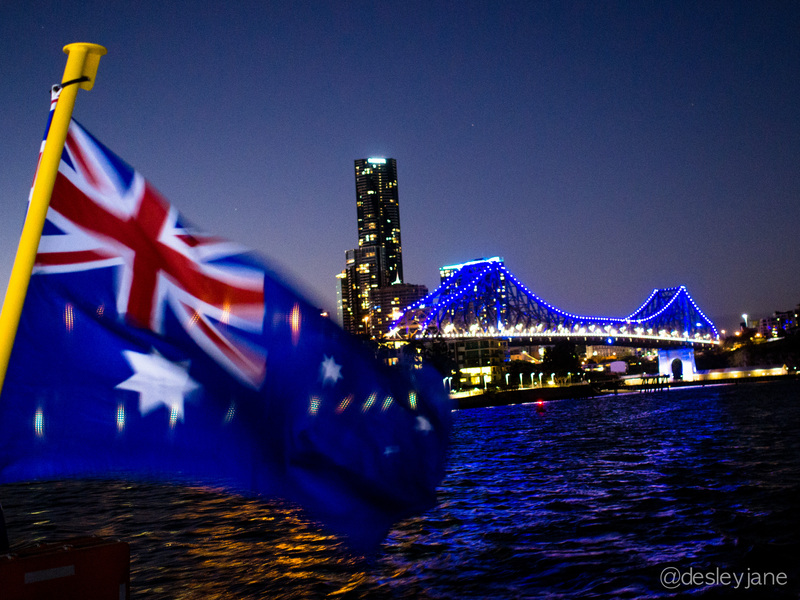 Happy Australia Day, Desleyjane! Hope you had time to celebrate! Love the pictures of the animals! Thanks Tildy. It’s a public holiday for Australia Day so BBQ with friends in the air conditioning!!! That shark picture was scary! LOL thanks, I took that photo at the Neptune Islands out of Adelaide in South Australia. I did a tour with Rodney Fox to see great whites. It was amazing!!!! The part about swallowing spiders is a little worrying…. (although I did swallow a fly). Great photos, love dropping by for all the happy memories of my time back there! Thanks Andy, yes it is worrying, I’m hoping it’s an urban legend! Best not to sleep on your back with your mouth open I guess? I had two friends have two separate spider incidents in the last 3 days. I think they are taking over!! Oooo, shall we write the script? Happy Australia Day! I want to visit your beautiful country some day soon!! Have a great holiday and thanks for sharing those interesting facts! Ps: the quokka is soooo cute and eeek indeed about swallowing 3 spiders a year!!!??? Omg yes, i wonder how big a spider people ingest?? Yes I would sleep with a mosquito net over me:) lol, nah just kidding… What a gorgeous country Australia is!!!! Haha it’s tempting, and if I had one, I probably would!! Happy Australia Day Desley, your pictures invoke happy memories of our trip to Australia :). How will you be celebrating? Thank you Loretta! Australia Day is almost over, we had a great day with friends – a barbeque, cold wine, excellent friendship, great conversation. And their dog had puppies a few days ago, so we got to cuddle them! LOL! And no worries mate 😉 I am constantly thrilled by your photographs of our gorgeous country, they are inspiring! Happy Australia Day! Btw, love the new look of the blog! Very chic!! Happy australia day desleyjanr! Its my last day in brisbane and i can say that you have the most kind and helpful people!! Hoping i could go back and explore sydney, melbourne, adelaide, perth and many more places!! I’m so glad you had a good time. Good luck with the rest of your travels! !